Waterproof Breathable Textiles Market size is projected to reach USD 2.18 billion by 2022, growing at 5.4% from 2015 to 2022. Mounting demand in active sportswear along with development of eco-friendly products should stimulate demand growth during the next six years. Owing to hazards of textiles made from synthetic raw materials, the industry is adopting bio-based raw materials which provide more comfort than the textiles produced from petroleum-derived raw materials. 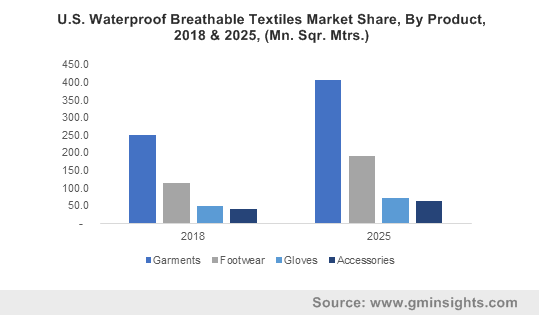 Waterproof breathable textiles (WBT) market size for active sportswear application was anticipated to reach USD 1,800 million by 2022, growing at a CAGR of over 5% from 2015 to 2022. Escalating usage of recycled PET bottles in order to produce waterproof breathable fabrics is also likely to surge market growth. For instance, Nike and SympaTex manufacture their products using reclaimed and recycled PET bottles. Furthermore, increasing consumer awareness regarding eco-friendly products has led to the development of recyclable, PFC-free and PTFE-free products. Increasing application scope could result in an attractive waterproof breathable textiles market price trend over the next seven years. Demand for antiviral, antimicrobial, stain/dew/dirt resistant textiles may positively impact growth over the next six years and witness substantial growth owing to technological proliferation and development of innovative fiber technologies that repel water or stains, manage moisture and allow fabric to heat, cool or breathe. The development of textile materials that are waterproof as well as breathable may be used across high-end application areas including medical and military sectors, and provides wide avenues for demand growth. However, risks associated with consumer preferences and fashion trends are likely to slow down the industry growth over the coming few years. Membrane waterproof breathable textiles market share lead the global industry, accounted for around 71% of the total demand in 2014, with gains estimated at over 5.5% from 2015 to 2022. It offers high resistance to water infiltration and also let water vapor to escape at the same time. This should encourage the demand over the forecast period. Densely woven textiles are anticipated to attain more than USD 200 million by 2022, grow at over 5% from 2015 to 2022. It comprises of synthetic or cotton microfilament yarns with trodden weave structure. Ventile, a popular waterproof breathable fabric are used in several applications including military, medical and workwear. Garments leads the global waterproof breathable textiles market, accounted for around 62% of the total industry share in 2014, with gains estimated at 5.1% from 2015 to 2022. Growing demand in numerous applications such as sports, mountain sports, and treks has boosted the demand. Organization of increasing number of world class sporting events could ensure continuous demand for such textiles over the next decade. Footwear is likely to grow significantly at over 6% during the forecast period owing to lightweight, high-strength and insulating properties of these fabrics. Active sportswear was the foremost application segment and was valued over USD 1,200 million in 2014. It is anticipated to attain USD 1,800 million by 2022 at 5.3% from 2015 to 2022. Breathability is of vital importance in sports to ensure ventilation to the skin during perspiration. It is comfortable, breathable and light which offers a great fit for runners and also operates as a critical base layer for colder days. These factors are driving the demand for this segment globally. Others applications were forecast to attain USD 300 million by 2022. It includes mountaineering, snow sports, water sports, outdoor lifestyles, business and rock climbing. Europe waterproof breathable textiles market was the foremost region and was valued over USD 450 million in 2014. It is probable to achieve USD 650 million by 2022 at a CAGR of 4.7% over the forecast period. This may be attributed to a large number of sport activities such as mountaineering and hiking in this region. Growing awareness towards fitness and health should drive demand growth over the next few years. Asia Pacific was likely to reach USD 576 million till 2022, by gains projected of 6.5% from 2015 to 2022. North America waterproof breathable textiles market is forecast to attain USD 600 million by 2022. Evolving consumer lifestyle and the need for apparels that are waterproof, breathable and at the same time in accordance with fashion trends will drive regional use over the forecast period. W L Gore & Associates was the industry leader, and accounted for more than 65% of the waterproof breathable textiles market share in 2014. The company provides an extensive product portfolio for several applications which includes GORE-TEX fabric. The company also offers its products across a wide range of applications including apparel, automotive, computing, medical, and military sectors. Other companies in the market include SympaTex and Polartec. SympaTex provides membranes, laminates, and similar other technologies in high tech functional materials such clothing, protective workwear, footwear and accessories. SympaTex membranes are environmentally friendly and completely recyclable. The company offers membranes that are eco-friendly and are usually PTFE-free and PFC-free.